Oh, to be crawling into that bed tonight! warm and cozy, but not grandma warm and cozy. thank goodness! love it! Brown and White together are so elegant! Yes, I agree it can be over the top - but these examples are gorgeous! Especially adore the birch legs in the first image - now that was a decent sized tree in its former life - and a real treasure in its current life. Love the dining area, the table is so unusual! That is one of the best tables I have ever seen! I just saw a recipe in House Beautiful for pumpkin cupcakes with maple frosting....I think food makes me most excited for the season. 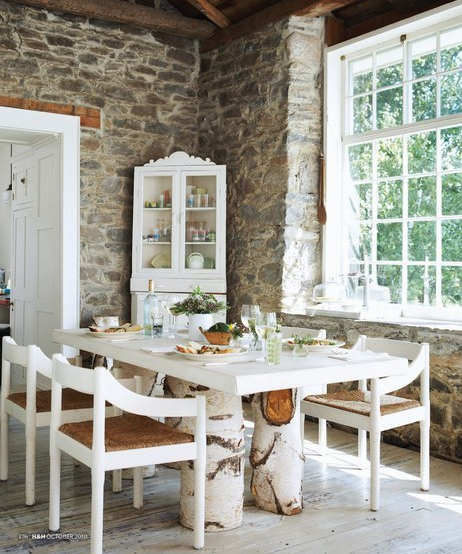 I adore the stone walls and the white decor gives the house a warmth and freshness. Thrilled to have found your blog...it's wonderful! That dining table is just amazing, I love the birch legs so much that I have started to convince my boyfriend that is exactly the table we need when we buy a new one. So it's fall in some places of the world, and everyone is cozy-ing up! Really like this rustic place, great images! tree stumps for table legs!? amazing. i love this cozy home too. Is that the bedroom we can see as just a sectioned off area? i really like it, very informal and stylish. I came across your post this morning while browsing interior design blogs and the topic of window treatment selection was very interesting to me. 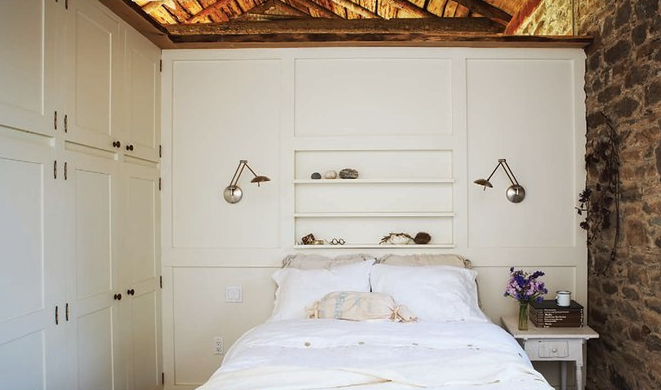 I, too, love the cozy feel that winter and fall bring, and long for a cabin-like space like these. Which window treatments work best in a space like this? It is true that you must dress your windows appropriately to bring out their true beauty. Thank you for writing and as a special thanks to you and your readers, I would like to offer a 20% off coupon using this code upon checkout: BLG20. All of these are awesome . Like these .